" Another Year Coming To A close In The Northern Forest!" Time seems to fly by here with another year about to end. It was a year with a few challenges. But, for the most part very rewarding. My life here is a very simple one interacting with my Canine Family and emerced in Nature. With having so many young people coming here to learn about the dogs and the lifestyle, I feel a little inadequate with respect to languages spoken. All these young people can speak several languages fluently. Me English and a lille French (not very good French). But then I realize: I can communicate with my dogs, I can speak to the Raven and they will speak back. I can sing along with my dogs and the Wolves. I know how to communicate and integrate with Mother Earth and its inhabitants. Well I guess I can speak more languages than I thought. The dogs are getting a scheduled week after a great training for the first half of the season with 250 training miles on both teams. Good timing as we in a frigid air mass lasting for a week with dayly highs in the -20's c and nightly lows -30's. This week, Rebbecca & Joe have left here to continue their adventures across Canada. They were a great help here and will be missed. Happy New Year from all of us at Miortuk and may 2018 be everything you dreamed about! "Great Weeks Never Get Tiring Here In The Northern Forest!" It was another super week here for running dogs. We had four days of running two teams per day. Two days of 10 miles,one day of 7 mile and one day of 13 miles. The dogs handled the runs beautifully showing great enthusiasm and no fatigue. The weather here has been very cold with temperatures through the night in the -20' to -30's celsius. Day time temperatures when running in the range of -15 to -19. The dogs enjoy running in the colder temperatures. But, for their safety, we don't run when it is -20 or lower to safeguard their lungs from frostbite. As you can see in the video, we had some beautiful sunny days. Also, if you look closely, you will see that the dogs are trained to relieve themselves on the run without stopping. Well most of the time, if a Leader decides to stop, the whole team comes to a screaming halt! Not everything is perfect all the time. Ha! Ha! "What A Turnaround In The Northern Forest!" This week was a direct opposite to last week. We received some snow and extremely frigid temperatures! The problem here with the snow was it was a little to dry to pack on the icy trails from last week. Thanks to Joe, our handler from France, He was able to convert our old trail groomer into a heavy, tobogganed bottom trail packer using old scrap pieces of metal to convert the bottom and old tires to add the weight. It worked perfectly to pack the trail and fill in the ruts maid by the ATV's made the week before. This resulted in our ability to get in 5 days of training with 4 days in a row, an off day Thursday and the 5th day of training on Friday. The dogs then received 2 days rest. Last weeks training included 4 days of running 7 miles and one day of running 10 miles. The dogs performed great and finished the weeks training maintaining their enthusiasm. I am so happy with the 20 dogs in training this year: Performance & Enthusiasm! 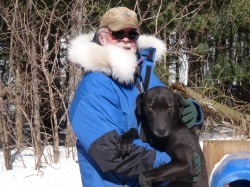 What more could a Musher ask for! Thursday was spent going to the village, down to Joliette and Terrebonne for supplies and for repairs to the truck's 4X4. Now is not the season to be without the 4 wheel drive option. We left here at 7am and by the time we returned fed the dogs and unpacked all the supplies, it was 9pm. Well, it is nice to be back in the serinity of the forest! "More Warm/Rainy Weather In The Northern Forest!" Great training Monday and Tuesday Morning and then nothing for the balance of the week. Tuesday after the run, it started to rain and softened up the trail. Then multiple ATV'S ran all over the trail rutting it with tire tracks. That night more heavy rain and then the temperature dropped leaving the trail an icy mess with frozen tracks etched in it. This week, we were getting a little very dry snow each night that would only barely cover the ice. The groomer did little to help. So, Joe decided to make a Pack Groomer out of an old trail groomer we had here. As of to day, we are starting to pack the trail real well. Now we need it to set up and harden. With the Packer , we were able to cover all the tire ruts. Hopefully, by Sunday, we can get the dogs back outrunning. "Rain, Snow And Porcupine, All This Week In The Northern Forest!" It was a week of challenges with icy conditions here due to rain and then on Thursday snow. However, that was not the biggest challenge of the week. My handlers(Joe, Rebecca and Jack) were out walking Roxy, when she went off the trail and came in contact with a Porcupine that was sleeping under a fallen tree. Poor Roxy got the worst of the encounter with a mouth full of quills. We quickly loaded her and ourselves in the truck and off to Joliette to get her to a vet. This is a 2 hour drive from here! The vet worked on Roxy for about an hour and half removing the quills. I want to thank Joe, Rebecca and Jack for their quick actions and concern for Roxy as well as the vet Dr.Elise Faribault including all the staff at Hopital Veterinaire de La Laurentie Inc. for their excellent work. We found only a few small quills that worked their way out over the next couple of days which were removed here at the kennel. ​Roxy is doing great and back to normal. Jack Trigg left here on Wednesday to continue his adventure across Canada. Jack was great help here with the Fall Training and a lot of fun. I would also like to introduce Rebecca Sansotta and Joeffrey Flory from France that joined the Miortuk Team in early November. Starting last Friday night through late Saturday afternoon, we had rain here and the temperatures dropped well below freezing Saturday night turning the trails into an icy mess. It wasn't until Thursday night that we received enough snow to safely run the dogs. We got the dogs out running on Friday and Saturday with two teams per day and 7 mile runs on both days. The dogs are really looking great and performing equally as well.